Have the original words been lost? The rset can be a total mses and you can sitll raed it wouthit a porbelm. Have the original words been lost over the centuries? "It is reassuring at the end to find that the general result of all these discoveries and all this study is to strengthen the proof of the authenticity of the Scriptures, and our conviction that we have in our hands, in substantial integrity, the veritable Word of God. 1"
"The existence of thousands of variations of texts makes it impossible to hold the doctrine of a book verbally infallible." 7.1 Is the wording of today's Bible error free or not? If, as Christians believe, the initial biblical autographa were inspired of God without error, how can we be certain we have that same inerrant message today? Isn't it likely that even if a perfect God gave a perfect message to imperfect man, man would eventually get it confused over centuries of copying? How can we tell if the original texts have maintained their fidelity as they were passed down from one generation to the next? Over the ages, and in spite of stringent safeguards, copyists have still made mistakes. Textual comparisons between the many biblical documents known to exist will verify this. Of course, the more ancient copies we have to compare between, the more easily the errant words or forgotten sentences can be identified. Currently there exist well over 24,000 ancient copies or portions of Scripture. These have revealed the variations to largely concern spelling and, to a lesser degree, word order and grammar. So is the Bible not free of error? It is the contention of conservative biblical scholars and orthodox interpretation that the original autographs, being directly inspired by God, were completely free of errors, but not necessarily the subsequent copies. Some of the earliest typeset Bibles, for example, had notable problems. One printing omitted the word "not" in the sixth commandment so that it read "Thou shalt murder". But today we do not consider "Thou shalt murder" the correct rendering of that verse. Why? Because of the process of textual criticism. It is by this process that we can trust the modern Bible to be as inerrant as the earliest known and best preserved copies. 7.2 What are examples of textual criticism? Fission, for example, is the term to describe the dividing up of one word into two words. An example in English would be the erroneous writing of "hardship" as "hard ship". Although the same letters are present in both, a totally different meaning is conveyed when the word is split. Fusion, conversely, describes the errant combining of two words into one. Dittography is the writing twice of a letter or word which should have been written only once. Haplography, opposite of the latter, is something that was only written once but should have appeared multiple times. Metathesis is the reversal of two words or letters or phrases in a passage. Homophony is the substituting of one homonym for another. There are also mistakes which are simply the product of a copyist misreading the text. These include the confusion of similar appearing letters, or the omission of an entire line of text, usually due to two consecutive lines beginning with the same word or words. 7.3 Where are the errors in the Bible? Because the number of extant manuscripts is in the tens of thousands (50,000 I am urged, though I have not seen confirmation of that figure), the total number of variations between documents as defined above is around 200,000 by the highest estimate. Although as critics might put it, these are "errors in the Bible", they must be accepted for what they really are - transmissional variations, not factual mistakes. She trimmed his gray beard. She trimed his gray beard. She trim med his gray beard. Trimmed she his grey beard. His grey beerd she trimmd. Shet rimmed his gray beard. She trimmed hes gray beard. These phrases, by the rules of textual criticism, offer thirteen variations in spelling and at least three different word orders. This yields a total of sixteen variations, or errors, in a single sentence that is itself only five words long. Yet even with three times more "errors" than words, it is still quite clear as to what is being said. a careful study of the variants of the various earliest manuscripts reveals that none of them affects a single doctrine of Scripture. The system of spiritual truth contained in the standard Hebrew text of the Old Testament is not in the slightest altered or compromised by any of the variant readings found in Hebrew manuscripts of earlier date found in the Dead Sea caves or anywhere else. It is very evident that the vast majority of them are so inconsequential as to leave the meaning of each clause doctrinally unaffected. 7.4 What percent of ancient documents are in agreement? On the average, Old Testament documents yield about one variation per page of text; New Testament manuscripts yield only a tenth of one percent variance. 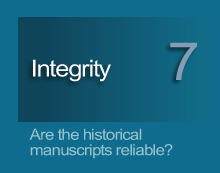 In other words, 99.9% of those manuscripts are in perfect agreement. Though an occasional scribe altered a text to be copied, the resulting deviant copy constitutes only an infrequent departure from the plethora of copies available for corroborating comparison. Even as later copyists unknowingly passed on certain aberrations, appeals to still earlier or more reliable documents preserve the original message. Thanks to textual criticism and on-going archaeological discoveries, even as time passes far beyond the date of the original writings, we may be confident that the Bible of today is a fully trustworthy duplication of the original autographs. NEXT: What early manuscripts of the Bible exist today? The previous chapter documented how the original writings were passed along. Now we need to evaluate the accuracy of that process. We must certify that the original words have been successfully transmitted to today's generation, and address the charge of errors in the Bible. 1. Error free or not? 2. Examples of textual criticism. 3. Where are the errors? 4. What percent of the documents are in agreement?